Tomatoes taste best when they're ripened on the vine, but sometimes there isn't time before the first frost in the fall. This happened to me last year - we had such a short growing season that most of my cherry tomatoes were still dark green when the temperatures started to drop. I googled the topic and discovered that you can ripen green tomatoes by bringing them indoors and placing them in the dark, somewhere cool. I thought I'd try, and took a large plastic container, lined it with paper towels, and spread out the tomatoes. I then covered them to keep the light out and waited, checking on them every couple of days. Voila! Success. I discovered something interesting, too... if I took out ALL the ripened tomatoes, it took longer for new ones to ripen than it did if I left a few ripe ones in the tub. 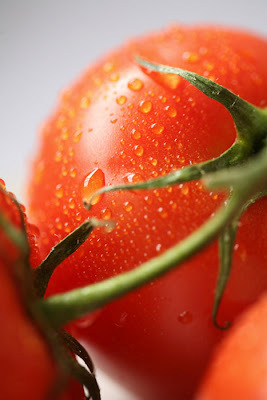 It turns out that ripe tomatoes produce Ethylene, which accelerates the ripening process for the others. Supposedly ripe bananas have the same effect on green tomatoes, although I haven't tried that one.